1. A journey and reminiscence. 2. A state of cultural fusion: i. Land of the earliest human. ii. Govapuri, the glorious ancient capital. iii. Portuguese invasion. iv. Grandeur of old Goa. v. St Francis Xavier. vi. Fall of the Portuguese empire in the east. vii. Temples of Goa. 3. A state of harmony: i. Konkani, Marathi and Portuguese descendents. ii. The Narayanans. iii. Sean Schneider and Liesbeth Smeenk. 4. 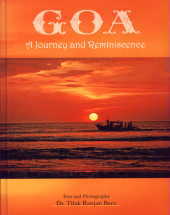 Goa, a state of mind: i. Sosegado, the essence of Goan existence. ii. Religious mind. iii. Football, music, dance. iv. Poets and artists. v. Fish, feni, babinca. 5. A state of colourful festivals: i. Carnival. ii. Sigmo. iii. New year. 6. A land of golden beaches: i. North Goa beaches. ii. South Goa beaches. 7. A paradise for nature lovers: i. Moods of Goa. ii. Monsoon in Goa. iii. Mandovi. iv. Wild life and bird sanctuaries. 8. An ecstatic destination for the tourists: i. Cities of Goa. ii. Destination Goa. iii. Cuisines of Goa. 9. Beyond Goa: i. Ingo's night bazar. ii. Tiracol fort. iii. Valpoi. 10. Metamorphosis: i. Portuguese Goa. ii. Old and new. iii. Marching ahead. Bibliography.